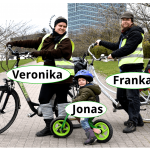 Is Vilnius a Cycling city? Definitively not. But it could be worse. On the other hand, Vilnius is very green city with plenty of forest and lakes around the city and even large Green areas close to the center (Vingis and Belmontas parks). In Summer time and out of the rush hours traffic is low compared to bigger cities in Europe. So despite of the lacking cycling infrastructure cycling is really fun in Vilnius. Short trips about 2 hrs. Standard trips about 3-4 hrs. Whole day trips — 6 hrs. Trakai is surely one of the highlights in Lithuania: A Medieval castle on an island within lakes, an Old village with wooden houses an very special traditions and food. A very special target not far from Vilnlus is the Medieval water castle and former capital of Trakai. Routes for the whole family and unexperienced cyclist (mainly avoiding roads with more traffic). The Bike Tour Season starts 1st of May: Daily City tours an MTB Tours!